You’ve seen most of this already. Skip over to about 8 minutes into the video, and you’ll see that Rick Perry really, really likes maple syrup. Either that or he thought it was whiskey. Or he was really giddy that he had some advance knowledge that Herman Cain was about to have a sexual harassment scandal. 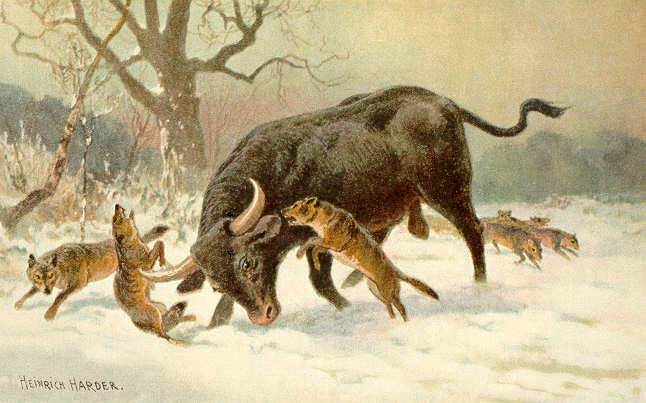 Wolves attacking an aurochs by Heinrich Harder. Such scenes would have been common in German forests, where both wolves and aurochsen once roamed. The wolf is now making a comeback to Germany, but the European aurochs, the ancestor of the domestic taurine cattle, is now extinct. One hundred years since hunting nearly wiped wolves out in Germany, they are moving out from their last bastion in the forests on the Polish border. While 11 years ago there was one pack, there are now 12, and the return of the wolf to all of Germany, said Professor Beata Jessel, head of Germany’s Federal Agency for Nature Conservation, is now “unstoppable”. The two-year study by the agency has surprised experts by revealing that far from requiring vast forests, the grey wolf has started to adapt to the modern environment. “Wolves do not need wilderness, rather they can rapidly spread in our landscape and fit into the most varied habitats,” said Prof Jessel in an interview with the Westdeutsche Allgemeine Zeitung newspaper. GPS tracking of one female wolf revealed that she built her lair just 500 metres from a busy road and raised her young undisturbed by the traffic. Two packs, comprising 18 animals all together, now live just 40 miles from Berlin. “One should thus be prepared for the appearance of wolves across Germany, and use management plans to establish the most conflict-free relations between people and wolves as is possible,” the professor added. The study also showed the huge distances wolves can travel. One male animal, called Alan by researchers, travelled the 963 miles to Belarus in two months, crossing countless main roads and swimming the Oder and Vistula rivers. This tendency to wander, wolf specialists say, should aid the spread of wolves across Germany. But canis lupis [sic] also face dangers. Wolves have struggled to shed a reputation forged in centuries of folklore and stories that casts them as sinister and ruthless killers, prepared to hunt down man or beast. This has made them a target for hunters. Official figures put the total of illegally shot wolves since 1990 at 13 but experts believe the true figure is much higher owing to hunters hiding the carcases. Road accidents also inflict an annual toll on the population with 17 reported deaths since 2000. If wolves can thrive and recolonize a country as densely populated as Germany, they will have virtually no problem recolonizing much of the United States. Wolves will live near people. However, that can cause problems. Wolves normally don’t consider people prey, but they will kill dogs over territorial disputes. And it’s a myth that don’t kill livestock. This means that Germany will eventually have to develop a problem wolf management plan. The country and its state governments should be working on these plans now. After all, it wasn’t too many years ago that I read that wolves were incapable of living near human settlements or agricultural enterprises. My guess is the majority of the German people are excited to have wolves back. This is, after all, the country with one of the most successful Green Parties in history. It’s been so successful that even the two major ruling parties in the country know they must please a Green constituency. It’s as important to their political economy as labor unions and business lobbies. My own ancestors likely joined in some of the slaughter of German wolves. It’s good to see that their error is finally being corrected. They will have the right to bear arms. It’s not often that a book causes you to stop and think. It’s even rarer for a book to make you question many of the long-held beliefs you may have developed over the years. 1. Dogs were derived from East Asian wolves. 2. Dogs are neotenous or paedomorphic wolves. Those two ideas have generally been accepted in much of the literature on domestication that it is generally hard to have a conversation about the subject without having to confront both of them. But what if both of these accepted facts were bogus? Well, it turns out that genome-wide analyses have found that dogs are likely not derived from East Asian wolves at all. The primary source for their genetic diversity are Middle Eastern wolves. And recent study that compared wolf cranial anatomy at varying ages with those of domestic dogs found that dogs simply are not paedomorphic wolves. Their unusual head morphology is the result of selective breeding, not the retention of juvenile traits. At one time, I bought into much of the Coppinger model for dog domestication, and I generally accepted the idea that dogs had self-domesticated in villages of the Neolithic. But by the time I started this blog, there were real problems with that model: namely that there were newly discovered dog remains that were several thousands years older than when the Coppinger model suggests they would have appeared. Dogs were the product of the Paleolithic, when humans were hunter-gatherers. As new discoveries in both molecular genetics and archaeology have continued to reveal that much of what we think we know about dog domestication is simply wrong, I began to wonder if maybe we needed a paradigm shift in our understanding of how this process actually happened. Mark Derr is the author of several great books on dogs. Dog’s Best Friend and A Dog’s History of America are both explorations of the human-canine bond. The former is an exploration of the various human cultures that have developed around domestic dog. The book examine the human side of the bond, and not surprisingly, it finds us wanting in so many ways. The latter is perhaps the most complete work of historiography ever written about dogs in the United States. It is also an exploration of the dog culture, but it is one that examines its evolution over time within the context of US history. However, it is in the question of how dogs became dogs that Derr makes the what is perhaps most ambitious attempt to explain how this human-canine bond began. Most of the literature on dog origins examines it from either a biological or social sciences perspective. The biological approaches often use just a few methodologies and are quick to discount evidence from other sciences. For example, archaeologists have been among the most conservative when it comes to examining the origins of dogs. For several decades, archaeologists claimed that the oldest dog was the one found at the Ain Mallaha site in Northern Israel. The remains consisted of a puppy that was buried next to a woman, and it has been dated to around 12,000 years ago. The first mtDNA assays of dogs and wolves found that dogs and wolves split around 135,000 years before present, which means that dogs were a product of a domestication that happened before modern humans left Africa. Which doesn’t sound plausible, until you realize a wolf subspecies was indeed discovered in East and North Africa– but it hasn’t been connected to the ancestry of the domestic dog. Derr hyperfocus on a single methodology. Such hyperfocus in as much blinding to reality as it is revealing, which is perhaps the book’s strongest point. Derr does not discount evidence that appears to contradict the findings that others have found. It is perhaps the most unique multidisciplinary approach to dog origins that has ever been attempted. No other book examines dog origins from so many different angles, using the latest evidence from molecular genetics as well as anthropology, archaeology, and paleontology– and some remarkable, good old-fashioned historiography. Derr just places these findings from such divergent fields into the proper context– which is quite rare for most books written on the subject. 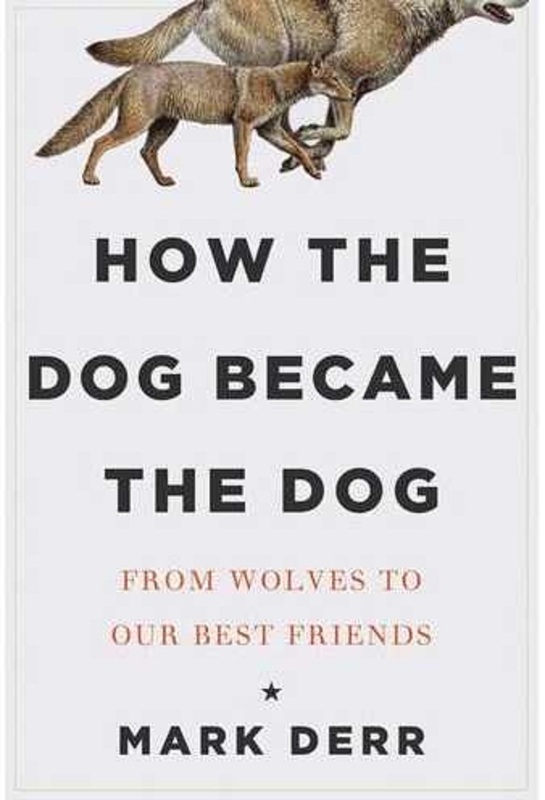 Ten years ago, the book on dog origins that everyone had to read was Raymond and Lorna Coppinger’s Dogs: A Startling New Understanding of Canine Origin, Behavior & Evolution. The book has a complete domestication theory that went something like this: About 12,000 years ago, the megafauna that were once so common during the Pleistocene began to die off. Hunter-gatherers and wolves were both without food, and when humans began to farm on the small scale, they were creating garbage dumps. Wolves would scavenge from the dumps. The wolves that could tolerate human presence more were better adapted to scavenging. Over generations of this selection pressure for less fear and less aggression, the wolves became genetically tamable. And because selection for tameness is also a selection for a bunch of domesticated traits, dogs became spotted and floppy eared. Because they were living in a low nutrition environment, their jaws and brains got smaller. Dogs are nothing more than developmentally delayed wolves, and because they have floppy ears and shorter muzzles, they are considered paedomorphic or neotenous wolves. Dogs are incapable of exhibiting full wolf motor patterns, and working dogs, like herders and retrievers, have been selected for an arrested predatory motor pattern. As I noted earlier, the theory that dogs are nothing more than juvenilized, developmentally delayed wolves has been falsified– at least in term of their physical traits. The notion that dogs are less intelligent than wolves and that they are somehow incapable of exhibiting full predatory behavior, even if members of specialized working breeds, has also been largely falsified through cognitive research and through the experience of anyone who has ever seen one of the specialized working breeds kill and eat something. Dogs are much better than wolves at gaining information from humans than wolves are– even if these wolves are raised in a captive situation. All dog domestication theories have a corollary that asks what this theory says about the differences between wolves and dogs. Coppinger’s theory suggests extremely large differences. Derr’s suggests much fewer differences. Coppinger rejects the name Canis lupus familiaris, which Derr embraces. Coppinger holds that giving the dog the full species name of Canis familiaris is necessary because dogs possess a different ecological niche than wolves. However, wolves often fill different ecological niches throughout their range, and the wolves Italy and the Middle East often live almost exclusively on garbage– as do legions of domestic dogs. Derr also notes these scavenging wolves have not become dog-like, except when they have cross-bred with them. So if not Coppinger, what does Derr propose is the more likely story of how dogs came into being? The answer cannot be described as simply as the theory proposed in Coppinger’s model. Derr contends that dogs are the result of interaction between humans and wolves, but this interaction happened over tens of thousands of years. There was no single domestication event– a finding that is revealed in genome-wide assays of dogs wolves. Most dogs have Middle Eastern wolf at their base, but some dogs have a contribution from European wolves and others wolves from East Asia. This relationship began while humans were hunter-gatherers. Humans and wolves began interacting with each other, and they occasionally took advantage of each other’s hunting prowess. In other situations in which two predators compete for the same prey, they become adversarial competitors. The most famous example of this enmity between two predators is that which exists between African lions and spotted hyenas. But humans and wolves went the other direction. Wolves began to attach themselves to humans, often just to scavenge from the kills, but they also likely participated in the hunt. Perhaps the relationship was a bit like what existed between some indigenous Australians and dingoes, where the dingoes were very useful in hunting but still retained their independence. For tens of thousands of years, man and wolf continued to relate to each other along these lines, with wild wolves contributing to the gene pool all the time. Although Derr agrees with the finding that most dogs have Middle Eastern wolf at their base, he contends that Central Asia is the place where dogs were first able to exist as a freely breeding population with very little contribution from wild wolves. It was in Central Asia that Middle Eastern wolves that had attached themselves to humans met up with similar wolves from Europe and East Asia. This meeting of the different camp wolves that created the sustaining population of these animals that evolved into the domestic dog as we know it today. It was this situation that most closely resembled a domestication event. Because with dogs, there was only a long domestication process, not a single domestication event. Derr claims that it was during the Last Glacial Maximum (ca. 25,000-13,000 years ago) that the dog began to develop the morphological features that resembled those which Coppinger and others suggest are the result of neoteny. It was at this time that humans began to experience a great gracilization of our bodies, which Derr finds actually came from a lack of good nutrition during this starving time. It is likely that the same pressures exerted themselves upon the wolves that were accompanying humans from this time period. This is why first morphological distinct dogs have been dated to this time period. Derr also questions whether we should be using the Siberian farm fox experiment as the basis for our understanding of how dog domestication happened. Derr finds several methodological flaws with the farm experiment, namely that foxes that were not selected for tameness also began to develop the spotted coats and floppy ears– and the domesticated foxes are larger and more robust than wild foxes. Further, the selection criteria that the Soviet scientists used was changed twice, and the main feature the scientists selected for was against aggression. However, there is no evidence that dogs were selected for reduced aggression, and we have plenty of examples of domestic dogs that are far more aggressive than wolves are. The model is interesting, but it cannot be used to suggest much more than this is the process by which the Soviets were able to domesticate the fox. The dog domestication process was much more complex than the one Coppinger suggests. 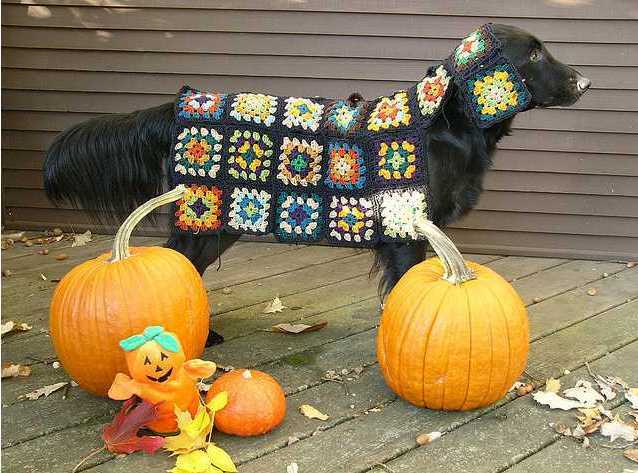 Dogs are both the product of biology and culture. They are both artifacts and specimens. Understanding that the dog is both a biological and cultural construct helps us look at the possible ways in which dogs evolved from wolves, but if we ignore either and choose to reject data that doesn’t fit our preconceived notions, then we won’t be able to see how it might have happened. Dogs are not neotenous wolves. They are the wolves who evolved to live with us. And we are the humans who evolved to live with them. How the Dog Became the Dog is now available at bookstores.